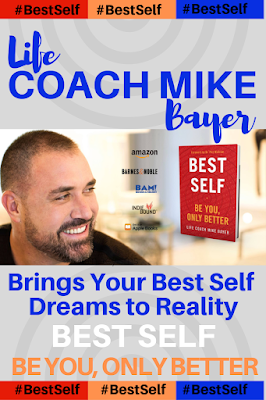 How many ways are there to take play to the next level? 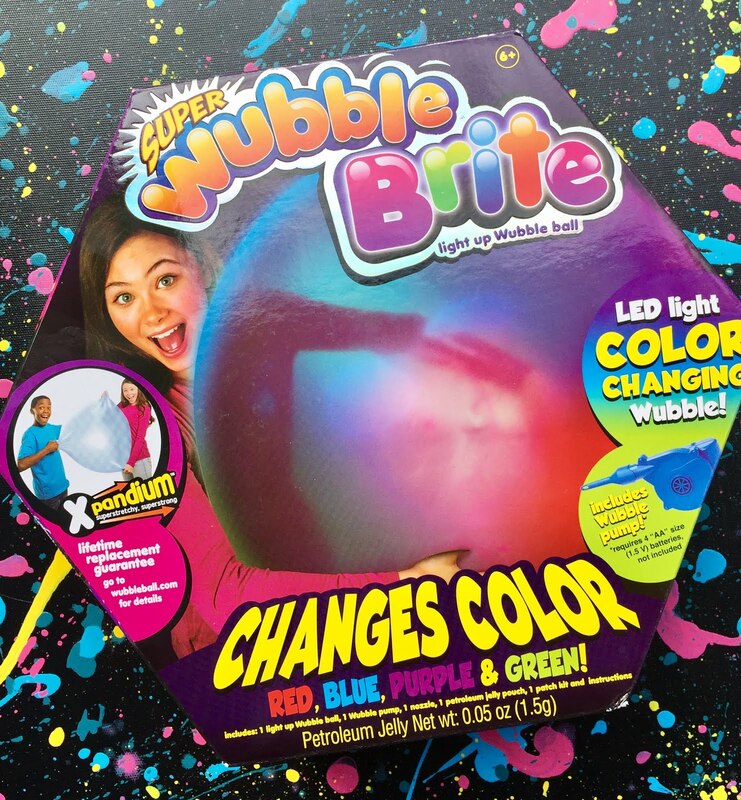 Bringing new light to the situation, bouncing on to the scene is the all new Super Wubble Brite LED Light Up Wubble Bubble Ball. Our family has been amazed by the bubble, bouncing fun we have had with Wubble Bubble Ball products. 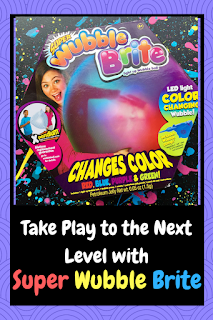 Here's how we are taking playtime to the next level, with the squishy, color-changing light show inside of a gigantic Super Wubble Brite Bubble Ball made for day time and night time fun. 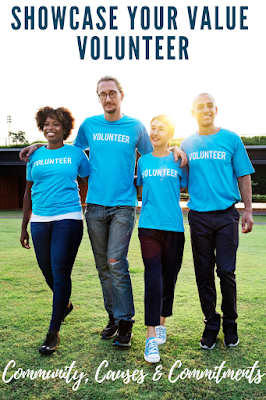 Thank you to the Super Wubble Brite promotional team for the courtesy of providing gratis product for editorial content purposes. It looks like a bubble, plays like a ball! It lights up and changes color! Are you trying to keep up with all of the amazing Wubble Ball products? I'll give you a cheat sheet- the fun all started with the original the amazing Wubble Bubble Ball, then expanded to include the Tiny Wubble Bubble Ball, Wubble X Anti-Gravity Bubble Ball, Super Glo Wubble Bubble Ball, Glo Wubble X, Water Wubble Water Balloon ball, Super Wubble Bubble Ball, and now the Super Wubble Brite, LED Light-Up Wubble Ball. Feeling just like the Wubble Bubble Ball, stretchy, squishy and squashy, Super Wubble Brite displays a colorful light show changing from from red to blue to green to purple, and all colors in between. Created for long lasting play, the durable, stretchable technology of Xpandium allows the Super Wubble Brite to start out small, then inflate with the included super pump to super tall. 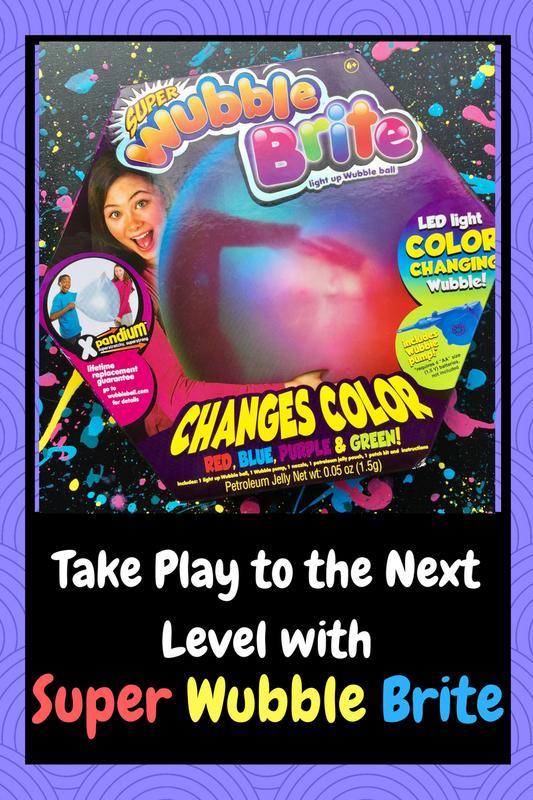 Enjoy squeezing, bouncing, and dancing in the dark with your Super Wubble Brite for next level fun. - Do Not use your Wubble as a flotation device—in any way! Even though it floats on water, it’s way too stretchy and big to work as a flotation device. Please, please don’t try that! - Do Not bounce on a Wubble like it’s a trampoline! It’s strong, but it’s not indestructible, and doing something like that would be dangerous! - Do Not inflate your Wubble over 36 inches! Sure, it CAN be inflated larger, but then you void your warranty, and you make the skin so thin that it can be damaged much easier. As we all know, a popped Wubble is no fun! - Do Not fill your Wubble with water! It gets WAY too heavy to have any fun with. - Do Not trap anyone UNDER your Wubble! EVER! You could make them suffocate! Please, please don’t ever do anything like that! - Do Not poke, stick, pick, jab, bite, or claw your Wubble with anything sharp! It will pop. You will be sad. We will be sad for you… The whole thing will just be very sad and that is not what Wubbles are all about!